Michael McNally:"Fontenoy 1745 - Cumberland's bloody defeat"
Now I had the chance to read the complete book. I've to say that I don't know a better book about this battle. The text is written in a clear and objective style. It's nice to learn a lot more about the allied left wing (the dutch wing) under Waldeck. Most publications are more focussed on the british-hanoverian wing neglecting the aspect that the dutch troops formed a numerical large part of Cumberland's army. The text is a lot better to read than Gandilhon's with all his repetitions and speculations especialy about the famous scene when the French and british guards had their meeting... I think that McNally made a good decision: it's not important what exactly was said by some officers. The outcome of the firefight is the crucial aspect of the event. The position of the units is easy to understand although the plans in the book don't show every batallion but all brigades and bn.s only if they played a important part in the battle. Nevertheless I had the Impression that McNally's book about Ramillies was more entertaining. He mentioned there more details of the fighting and short biographical notes, which helped sometimes to understand the action of some of the officers. What I liked very much was that McNally worked out the essential decisions of all leaders. 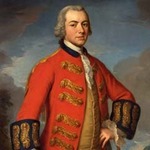 It became a lot more clear to me why de Saxe had such problems even during the last hours of the battle when his troops outnumbered Cumberland's effective fighting forces extremely. The question was if quality in leadership (excluding perhaps Cumberland himself) and descipline would win against quantity. It's perhaps somehow strange that I could not find any numbers of the total losses of both sides in this book. What I mostly didn't liked were the pictures. There are only three illustrations by Ó Brógáin and although they are much better than these by Pierre Joux they are not looking really professional. There's only one picture showing a bigger sector of the battle - and which is helpfull to illustrate the events and positions. But the figures on this picture are looking angular without any details of uniforms etc. (and blue French guns!). I would prefer the style of Jerry Embleton who worked for the Cullloden-book. But I've to say that I liked very much Ó Brógáin's sketches in Brown and White in the Ramillies-book. What was very surprising to me was that there is not one picture of an austrian soldier or general in this book. But there is no picture of Dutch generals or soldiers too! The most usefull pictures are photos of the uniforms that Gabriele Mendella made for a exhibition in Milan. But these reconstructions show french elite Units only (except one uniform of a british redcoat). The plans are looking quite well and are usefull. I was astonished that the famous Morier-paintings were not used (he painted Swiss in Dutch service for example). The contemporary paintings are too small to be really usefull - the same thing like in Gandilhon's book. Although it is to be said, that McNallys book show no wrong uniforms. The photos of the original battlefield are very nice and helpfull for the understanding of the events. I've to say that I like the book. It's fine as far as it goes. Most readers will get enough of information for a refight on tabletop. It's a good addition to the number of books about this bloody battle. I would recommend the book to everybody interested in the period. Thanks for the review. It is certainly good to see the Dutch part of the battle receiving more attention in an English-language book.